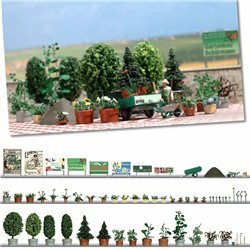 Extensive accessory set for creating gardens and landscaping. With the contents one can make more than 40 planters, flower pots and bowls with extremely realistic Schefflera, Philodendron, Gerbera, fern, etc. In addition, the set contains 4 ornamental trees and 2 firs, which can be likewise used as potted plants. The set is supplemented by a trailer, wheelbarrows, heaps of sand, tools, »Rosenkugel« balls for good luck and ground cover material. Includes one cut-out sheet with suitable graphics for advertising, like market garden, garden centers etc. and poster panels for attachment. Supplied with special needle to simplify »planting« of the various plants.